I have a confession to make. Until now, I'd never tried a subscription box. I know, I know. I'm not worthy of the blogger title. But the good news is that now, thanks to Curated Combination, I can finally say I've experienced the excitement of opening up a beauty subscription box! Because I'd never had one before, I didn't really know what to expect from my box, but I was very excited to see what was inside. Let me tell you, I was not disappointed! Every product inside was full-sized and from a recognisable brand. Maybe I'm a snob, but it was reassuring to see brands I know to be great quality. The first thing I noticed was the wonderful smell- a gorgeous lavender fragrance, which is my absolute favourite. On closer inspection, it became apparent that this scent was coming from the Bramley hand cream, containing lavender, geranium and pettigrain. 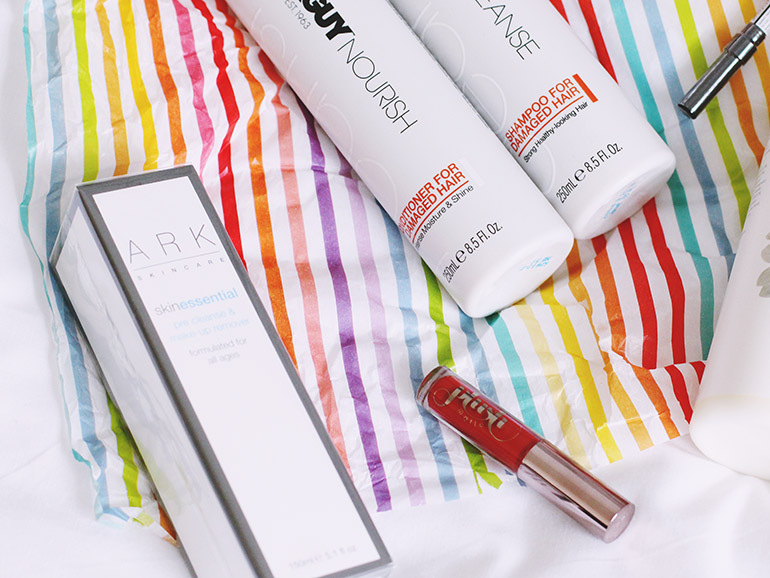 And while we're talking about beautifully-fragranced skincare, there was also a bottle of Ark pre cleanse and make up remover. I met a representative for Ark at a blog event a while back and I was incredibly impressed with the products, so I'm very excited to have my own bottle to try. I was most excited when I saw the Toni & Guy label... and then another one. 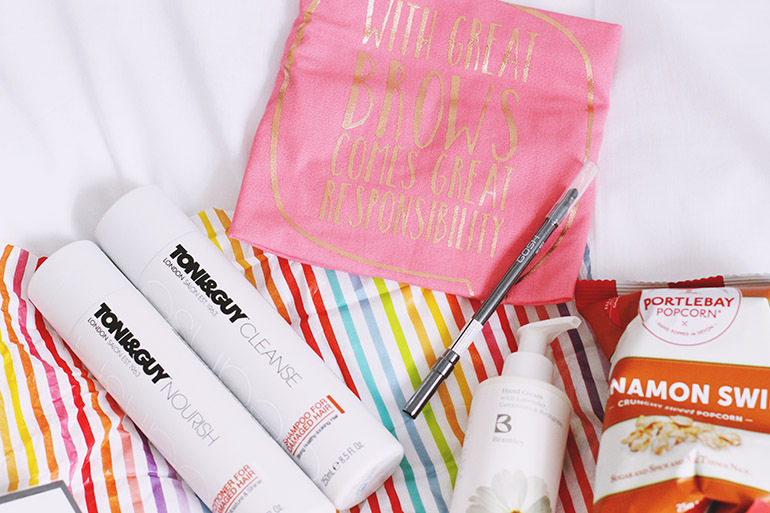 Aside from all the other great products, the Curated Combination box contained two bottles of Toni & Guy haircare. I'm making an effort to take much better care of my hair lately so I cannot wait to try these! Even better, the products- a shampoo and conditioner- are for damaged hair which is exactly what mine needs! It's like they were chosen especially for me! It's not all big bottles though. There were also some lovely smaller products including a Make Up Geek liquid lipstick which is perfect as I was looking for this exact shade of red! Then there was the GOSH eyeliner pencil, the super cute slogan tote bag ('With great brows comes great responsibility') and a bag of cinnamon popcorn which, of course I opened straight away! The best bit? The box is only £12.50! I'm amazed by how many products were included, and how great they were. My first experience of a subscription box was certainly very positive! If you want to try out your own Curated Combination box, you can find all the details here. Curated Combination provided the box in exchange for review but all opinions are my own. Thank you Curated Combination!